Barcelona have been known for tapping South American players up in the past. But many people didn't believe it. Believe me now they will ! Gerard Pique believes Philippe Coutinho is doing everything he can to force his way out of Liverpool, but says Barcelona are struggling to close the deal because the Neymar money has sent the value of their transfer targets through the roof. Pique told Sportsmail: ‘I think players still want to join Barcelona, and they are showing that as is the case with Coutinho and Ousmane Dembele. One by putting in a transfer request and the other with his actions at Dortmund. It suggests that they are both delighted about the idea of coming; they want to come. ‘The problem is, we sold Ney and the clubs know we have the money from that, and the market is the way it is. I don’t think it’s because the players don’t want to come, they are keen to come to Barca, but right now sign whatever player the club wants, it seems to cost more'. Speaking at a Poker Stars event in Barcelona, Pique also defended Lionel Messi’s decision to bide his time over the new contract that he has agreed but not yet signed. 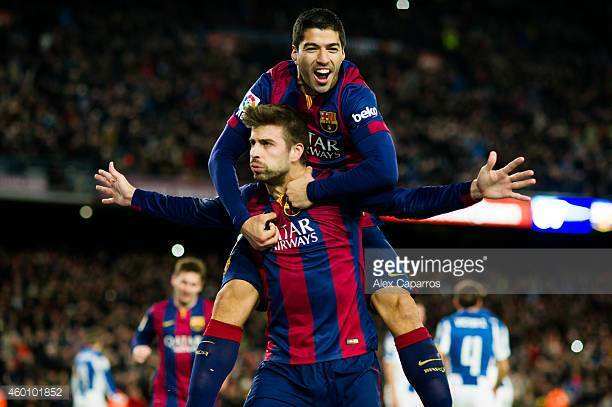 Pique said: ‘All players have the right to sign or renew their contracts when they want to. In the end a renewal is a question for the club and the player. That's true in all cases, I’m not just talking about Messi. He admitted that the board’s task was tough but also said: ‘We have got a good squad but it’s true that if more players arrive there will be more competition in each position and that is always best for the team. Pique was pictured with Neymar at the Brazilian’s birthday celebrations for his son Davi Lucca this week, and after his acrimonious departure from Barcelona many supporters were upset at the images. Pique was also accused of timing the posting of the photos on social media so as to aim a dig at the board, who the same afternoon had confirmed they were filing a lawsuit against Neymar. ‘These things happen,’ said Pique about the photographs. ‘You have to put them in context. We were at a celebration, a children’s party with Ney, and it’s normal for there to be photos. ‘He wasn’t just a team mate, he was a friend and just because he has left we are not going to renounce our friendship with him. It was just a coincidence that it was the same day. We all need to be together. 'I understand that because Ney has gone the fans could be upset at the photos but they have to understand that Ney was here for five years and he is more than just a team-mate, he is a great friend. 'Independent of the fact that football is important – of the things that aren’t important it’s the most important – in the end what really matters are the friendships and people, and we are not going to renounce our friendship with Ney because he has left the club in a certain way. 'He is a great friend not just of me but also of all the squad. He should be able to share a party with his son and with our children and sharing photos doesn’t do any harm. We talked about Paris, how he’s fitting in, just normal topics of conversation between friends. ‘I understand that there are people who do not understand the way he has left the club but there was a club that paid the buy-out clause and Ney decided to leave.